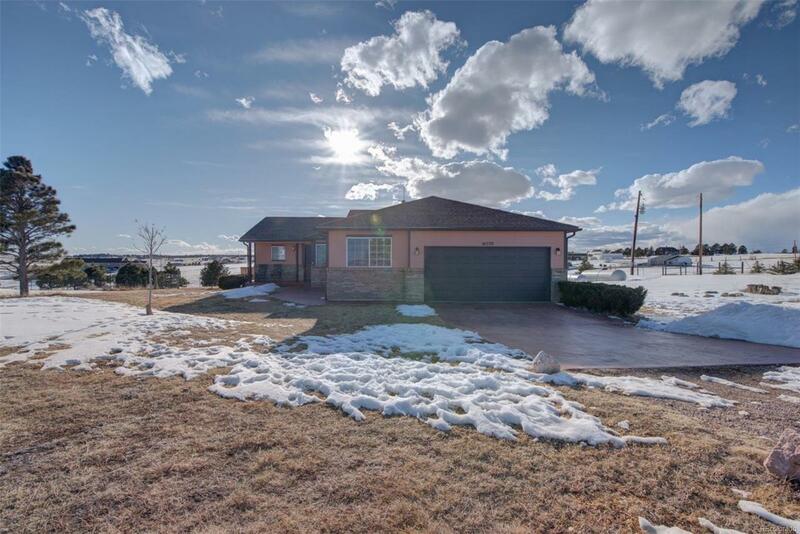 Welcome to your private 4 bedroom/ 2 bathroom country rancher with stunning Pikes Peak and front range views! Cozy front porch greets you upon entry. New flooring throughout main level. Lots of natural light and views in the open great room, dining, and kitchen area. Gas fireplace and walk-out to the deck (wraps around the side). The unfinished basement walks out to the backyard and awaits your future design. Three of the acres are perimeter fenced. Zoned for horses and other livestock. Storage shed. A/C. Home generator.Large Master with double closets and 5pc adjoining bathroom suite. Laundry has utility sink. Spacious bedrooms. Privacy gate.